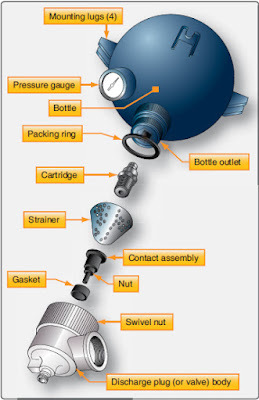 Regular maintenance of fire extinguisher systems typically includes such items as the inspection and servicing of fire extinguisher bottles (containers), removal and reinstallation of cartridge and discharge valves, testing of discharge tubing for leakage, and electrical wiring continuity tests. The following article contains details of some of the most typical maintenance procedures. Fire extinguisher containers are checked periodically to determine that the pressure is between the prescribed minimum and maximum limits. Changes of pressure with ambient temperatures must also fall within prescribed limits. 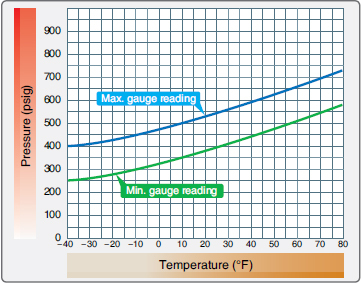 The graph shown in Figure 1 is typical of the pressure-temperature curve graphs that provide maximum and minimum gauge readings. If the pressure does not fall within the graph limits, the extinguisher container is replaced. The service life of fire extinguisher discharge cartridges is calculated from the manufacturer’s date stamp, which is usually placed on the face of the cartridge. The cartridge service life recommended by the manufacturer is usually in terms of years. Cartridges are available with a service life of 5 years or more. To determine the unexpired service life of a discharge cartridge, it is usually necessary to remove the electrical leads and discharge line from the plug body, which can then be removed from the extinguisher container. If a cartridge is removed from a discharge valve for any reason, it should not be used in another discharge valve assembly, since the distance the contact point protrudes may vary with each unit. Thus, continuity might not exist if a used plug that had been indented with a long contact point were installed in a discharge valve with a shorter contact point. Note: The preceding material in this has been largely of a general nature dealing with the principles involved and general procedures to be followed. When actually performing maintenance, always refer to the applicable maintenance manuals and other related publications pertaining to a particular aircraft.